In less than two months, regulators have seized 14 banks. Experts think many more banks will collapse before the financial crisis is over. 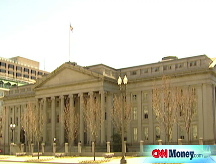 NEW YORK (CNNMoney.com) -- If it's Friday, there must be a bank failing somewhere across the country. For six consecutive weeks, industry regulators have seized control of a bank after the market closed on Friday, bringing the total number of failed banks so far this year to 14. To put that into perspective, 25 banks failed in 2008, suggesting that the rate of failures is quickening as the economic crisis deepens. "We'll have a banner year [of failures] this year," said Stuart Greenbaum, retired dean and professor emeritus at the Olin Business School at Washington University in St. Louis. At the current rate, nearly 100 institutions -- with a combined $50 billion in assets -- will collapse by year's end. The latest is Oregon's Silver Falls Bank, which was closed by U.S. regulators Friday. With more consumers and businesses likely to default on loans as the recession drags on, some industry observers think the pace of bank failures could accelerate further. Gerard Cassidy, managing director of bank equity research at RBC Capital Markets, upped his expectations for bank failures earlier this month, warning that he anticipates 1000 institutions could fail over the next three to five years. "The sooner the bank regulators can shut down the troubled banks, the faster the industry will get back on its feet, in our view," he wrote. Still, the current crop of bank failures hardly comes close to what happened during the savings & loan crisis two decades ago. And many experts are quick to draw distinctions between the two eras. During the last crisis, many savings and loans were coping with an inability to adapt to higher interest rates, while many banks were significantly undercapitalized to deal with losses. "That is not our problem here," noted Ann Graham, a professor of law at Texas Tech who spent part of her career as a litigator for the FDIC and Texas' Department of Banking during the 1980s. Instead, she said the main problem now is that banks have been stuck with assets in their loan and investment portfolios that have quickly soured. It's also worth remembering that when banks fail, they don't close down for good. The Federal Deposit Insurance Corp. guarantees deposits up to $250,000 in single accounts. Also, the FDIC often is able to find a willing buyer for the failed bank immediately, which means little, if any, disruption for the failed bank's customers. Still, regulators face a crisis of significantly larger proportions today that promises to keep the nation's banking industry strained for some time. Even though the overwhelming majority of the banks that have gone under since the beginning of 2008 are smaller community banks, there have been two notable big bank failures. Last year, the California-based mortgage lender IndyMac failed. That was followed by the collapse of savings and loan Washington Mutual, the largest bank failure in history. The FDIC seized WaMu and immediately sold its banking operations to JPMorgan Chase (JPM, Fortune 500). Several experts fear the potential for another large bank failure. While the U.S. government has repeatedly said it will not allow major institutions to fail, namely Citigroup (C, Fortune 500) and Bank of America (BAC, Fortune 500), some embattled regional banking giants may be too far gone to save. "Conceivably, we'll see some larger names fail as we go forward," said Frank Barkocy, director of research with Mendon Capital Advisors, a money management firm that invests primarily in financial stocks. Regulators have indicated they are gearing up for tougher times. In addition to requesting an increase in its borrowing authority from the Treasury, the FDIC has maintained that it expects its deposit insurance fund to suffer $40 billion in losses through 2013. Last summer's collapse of IndyMac wiped out $8.9 billion from the fund. Fearful of drawing down the fund any further, banking authorities may attempt to broker more assisted acquisitions like JPMorgan Chase's purchase of Washington Mutual, where the purchaser acquires the deposits and a portion of the failed bank's bad assets. "The [FDIC's] incentive is not to have a bank failure at all," said Jack Murphy, a long-time partner at the law firm Cleary Gottlieb Steen & Hamilton, who previously served as general counsel for the agency. "If it is possible to have a private market solution, that is ideal." Next week, regulators are expected to provide a better glimpse of the health of the banking sector, when the FDIC presents its quarterly banking profile for the fourth quarter of 2008. One highlight of the report will be the agency's so-called "problem bank" list. That number is expected to climb from 171, where it stood at the end of the third quarter. Some have charged that the list is hardly reliable, given that only a fraction of the banks that are included ever actually reach the point of collapse. Nevertheless, a big jump in the number of banks on the problem list could serve as an indicator that there will many more Friday failures to come this year.